Gluten Free Cranberry Cookies, easy to follow tasty recipe. These gluten free cranberry cookies are made with real butter and lots of cranberries giving them a fantastic flavour. They are an ideal treat to share with everyone whether they need gluten free food or not. We have noticed how cookies seem to span the generations, loved by all ages from Grannies to Grandsons, Grandpas to Granddaughters. 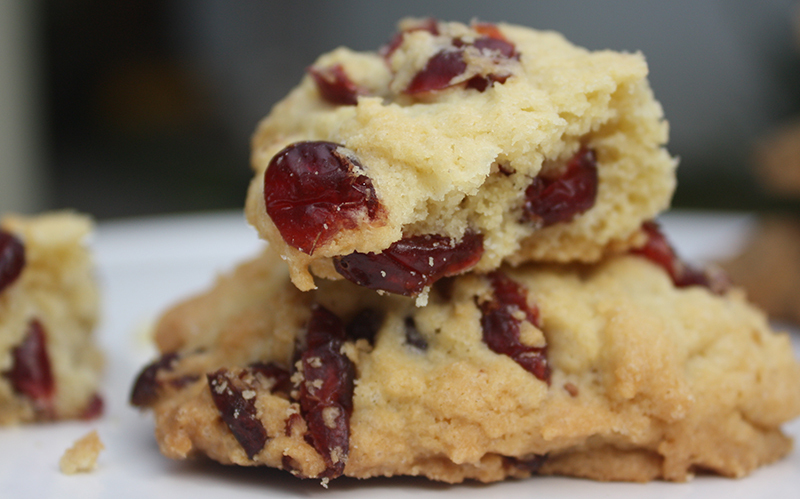 We have found that cranberry cookies are particularly popular with grown ups. They are a lovely accompaniment to a chat over coffee with a friend. Or, if you want to make clients or business contacts feel extra special, serve these home made gluten free cranberry cookies at your business meetings. It will help you stand out from the crowd and give you massive brownie points with any clients who need gluten free. These gluten free cranberry cookies are easy to make and make a lovely moist chewy gluten free cookie. These gluten-free cookies freeze well once they are made. However you can also freeze the dough. When you want some cookies it is easy to defrost the dough, shape into cookies and bake as normal. Or, do what we often do, freeze the dough in already formed cookie shapes, then you simply pop the frozen cookies onto a baking sheet and bake from frozen, what could be simpler. An additional tip, to make sure you can separate the frozen cookies, keep them apart by placing a piece of grease proof paper or baking parchment cut to slightly bigger than the cookie’s size between each cookie before freezing. As when preparing any gluten free food, just be careful when you make them to ensure they stay gluten free. We have some easy to follow tips on our Avoiding Gluten page. This quantity will make approximately 15 smallish cookies. 2. Grease flat baking tray. 3. Mix butter and sugar until creamy and well mixed. 4. Break egg into a bowl and whisk with a fork, add the vanilla essence. 5. Sieve the flour, baking powder, salt and xanathan powder together. 6. Add egg and vanilla to the creamed butter and sugar mixture. 7. Add all the dried ingredients in one go and mix gently, stopping immediately everything is mixed together. 8. Add the cranberries and mix gently with a spoon only as long as it takes to mix the chocolate evenly through the mixture. 9. Take a spoonful of mixture, quickly shape into a rough ball , place it on the prepared baking tray and flatten with your hand. 10. Bake in oven for 10-12 minutes. Leave the cookies to cool slightly before removing them gently from the tray and placing on a cooling rack to cool completely. Why not try our recipes for Gluten Free Chocolate Chip Cookies and Gluten Free Cherry Cookies.